Turkish authorities committed human rights abuses "on a massive scale" while trying to quell anti-government protests over the summer, Amnesty International says. The group says live ammunition was used, killing one protester, and some women protesters were sexually abused. It says other demonstrators were badly beaten, resulting in one death. The unrest began in May as a protest to stop the redevelopment of Istanbul's Taksim Square and Gezi Park. But after a harsh crackdown by riot police, it snowballed into nationwide anti-government demonstrations that lasted for weeks. Prime Minister Recep Tayyip Erdogan defended the police action and denounced protesters as "terrorists". However his deputy, Bulent Arinc, acknowledged that the police had gone too far, and apologised to protesters who were injured in the original operation. Amnesty International's report says investigators interviewed scores of people who were injured, unlawfully detained, beaten or sexually assaulted during detention. Andrew Gardner, Amnesty International's expert on Turkey, said: "The attempt to smash the Gezi Park protest movement involved a string of human rights violations on a huge scale. "They include the wholesale denial of the right to peaceful assembly and violations of the rights to life, liberty and the freedom from torture and ill-treatment." 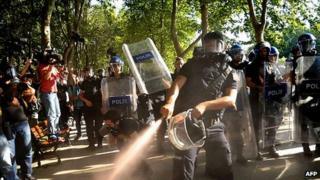 "The levels of violence used by police in the course of Gezi Park protests clearly show what happens when poorly trained, poorly supervised police officers are instructed to use force - and encouraged to use it unsparingly - safe in the knowledge that they are unlikely ever to be identified or prosecuted for their abuses," said Mr Gardner in the report. "The Turkish government must learn to tolerate the dissenting opinions expressed through street protests and ensure that police are equipped, trained and instructed to police them lawfully," he added. Turkish authorities have not yet responded to the report. Earlier this year, the government said a policeman was also killed in the protests and some 600 officers injured. Prime Minister Recep Tayyip Erdogan, who was branded a "dictator" by protesters, initially appeared to want to placate demonstrators but later hardened his rhetoric. At huge rallies of his supporters he claimed the protesters were "extremists" who had been manipulated by "terrorists". He also suggested that an international conspiracy with financial interests was behind the protests, but did not elaborate. In June, the deployment of gendarmes - a military unit under control of the interior ministry in peacetime - caused shock among some protesters in Istanbul. Gezi Park has since reopened although its future is still uncertain. Turkey media crackdown: Who to blame?